Are you leaving money on the table? You are if you’re treating performance management as a standalone process. Performance management works hand-in-hand with every other phase of the employee lifecycle: learning, succession, and even recruiting, as existing performance competencies of star performers can help you define criteria for new employees. Creating a true performance management culture also drives engagement, retention, and profits. Case in point: in a Harvard Business School study, organizations without a performance management culture increased net income by only 1% over 11 years. But those with one saw a 756% increase over the same time period. 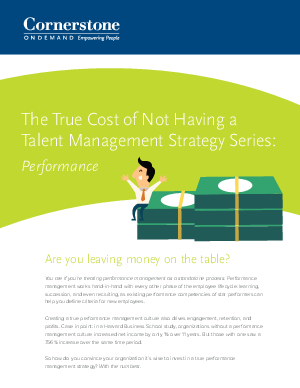 Download this white paper to learn the importance of a talent management performance strategy.